Speed: 30 ft., swim 20 ft. The Selere (prn: sell 'Air) are an aquatic race of elves of unknown descent. They claim no ties to either the Tenerthor nor to the Earinai, and live for the most part in total seclusion from the rest of the world - except for the occasional merchant ship which they deign to contact occasionally. Individual Selere have long green-blond or blue-brown to blue-black hair which is usually worn short. Longer hair styles are a general indication of wealth and rank in society. Their eyes are slightly larger than their land-bound cousins and are almond shaped and often tinted brilliant and attractive rainbow hued colors. Like other humanoid dwellers of the oceans, the Selere have increased webbing between their fingers and toes. Their noses are broader, more sloped, and their ears are larger and more pointed than other elven races. Selere, like the Tenerthor, tend to adorn themselves with jewelry and tattoos. Because they must constantly swim through the water, the Selere are powerfully built. Even the feminine half of the race are typically substantially stronger than a fit, male-human laborer. Unlike many races, the Selere have developed two languages which every Selere knows. First is a musical, spoken tongue whose interpretation is heavily altered with facial expressions and subtle body language. The second language is a complete and comprehensive sign-language by which the Selere can communicate privately with their hands. Since sounds travels easily underwater, most private conversations are held by standing close to one another and using this hand-language. Their first, spoken tongue, is called Jsujulian. The hand-speak is called Jsuclaeleu. Non-natives can never hope to master either tongue and at best will only ever understand about 80% of either of these complex languages. Selere make frequent use of poison, delivering the toxin to their opponent in hollowed out bone tipped weapons such as tridents and daggers. Selere also make use of weighted nets to further entrap swimming opponents. Poison: Selere frequently employ poison with their tridents and weapons. The tips of such weapons are barbed with hollowed bone containing the poison. A bone-tipped Selere weapon can inflict three poisoned attacks before needing to be re-applied. Puffer poison is an injury inflicted poison whose initial damage is 1d6 Strength and secondary damage is paralysis for 2d6 minutes, Fortitude (DC 13) negates. Darkvision (Ex): Selere are able to breath upon land but rarely venture to do so. Since the bottom of the ocean is a very dark place, Selere have adapted to their environment and gained the physiology necessary for darkvision. Selere darkvision has a range of 60 feet. Water Breathing (Ex): All Selere possess an advanced respiratory system and can breath underwater as easily as they can breath the air above water. A Selere cannot drown in water, but may drown in other non-oxidized liquids and may suffocate from smoke or other conditions which prohibit the taking in of air. Thick Skin (Ex): Selere have a naturally thick skin to help keep them warm in the cold depths of the ocean. This thicker skin also grants them a natural armor class of 12 and reduces all bludgeoning damage done to them by 1 point per die. This includes falls from great heights, but not crushing damage, such as being constricted by a snake or crushed between to closing walls. Resistances: Selere, like much other sea-life, have a naturally strong resistance to toxins. They receive a +2 racial bonus to resist poisons. Gasseous Vulnerability: While gaseous attacks are rare under the ocean, they are more common on the surface. Since a Selere breaths through an advanced respiratory system of both gills and surface-breathing lungs they are more susceptible to such attacks and suffer a -2 penalty to all saves against harmful gas related attacks. Skills: A Selere elf has a +8 racial bonus on any Swim check to perform some special action or avoid a hazard. They can always choose to take 10 on a Swim check, even if distracted or endangered. They can use the run action while swimming, provided they swim in a straight line. Though they shun contact with the land born races, their presence is well known. Ships which pass uninvited through their waters run the risk of being pulled into a sudden and unexplained whirlpool or attacked by the guardians which the Selere post near the surface and around their cities. Typically this territory is marked with floating stones on the surface of the waves with numerous skulls of various creatures adorning it to warn away sailors and others from mostly unintended harm. They do prize their privacy, but they do not wish to harm more than is needed to maintain it - especially when fair warning is given. While mostly separated from the world of land-dwellers, the Selere are one of the few aquatic races that does any trade with the surface at all. Being such, many rarities which are unfound anywhere else in the world pass from the hands of the Selere to those lucky and wealthy enough to do trade with them. Underwater, the Selere are not a race bent on the conquest of other races, instead they have consolidated themselves and relentlessly defend that which they call their own. Other underwater races usually give the Selere their space since the Selere demand very little of what is available, and because the effort to take land from the Selere is more trouble than it is worth. The Selere live in a fantastic aquatic city called Jsucluemae. Like a sunken Atlantis, the underwater lands of the Selere are arranged in concentric circles. The wealthier and more influential live towards the center where those less so cannot dream of entering. Their society has strict cast systems at every level and power is inherited from father to son. Laborers tend farms of underwater plants, work as stone masons or iron-workers, or as servants to the more powerful. They are ruled by a council of 12 Shedumen, each one being a dictator of one of the dozen rings of cities that make up their civilization. The Shedumen have total power over the lives of those who live in their ring and can do most anything without question or reprimand. The head of this counsel is the Krakenduman, a mythical being which is never seen, only heard. The Krakenduman, or Kraken, is said to be a being of nearly god-like powers which dwells at the bottom of a great well-like bore that penetrates the world to unknown depths from the very center of the Selere civilization. Only the twelve counsel members and criminals sentenced to death are allowed into the inner sanctum that guards the entrance to the Bore of the Kraken. The criminals are bound with weights and sent sinking into the darkness of the Bore. The legend among all Selere unprivileged to enter the sanctum is that the voice of the Kraken echoes up from deep within the Bore to render prophecy, decision, or guidance to the members of the counsel. Selere society is rigidly divided into several castes: slaves, freemen, servants, laborers, artisans, warriors, minor authorities, business-class, the leisure- class, and it's ruling class. The slave class are frequently the unfortunate Selere born with some disability, criminals punished by mutilation and placed in forced slavery, and mindless automatons that carry out their tasks without care or ambition. Slaves have no rights in Selere society because they have been forcibly taken away. They are treated with disdain, though few Selere would actually go out of their way to abuse or associate with a slave. Selere typically mate within their class. Selere live in independent city-states in which each of these classes are present. Freemen are basically bums that live off the free produce of the sea. They work for themselves and do not contribute to society. They are frequently rejected by their families and may be eccentric. Freemen have no rights in Selere society because they don't contribute to it, and so they usually try to keep from attracting attention to themselves. Freemen may choose to find a business-class Selere and if they are successful at finding a sponsor they may become a laborer or artisan. Laborers make up the bulk of Selere society. Their duties and jobs are inherited from their family and they are equitably paid and cared for in return for their labors by business-class Selere. Skilled laborers may ascend from their station in society to the artisan class if their craft is particularly unique, well done, or in demand. This class change isn't official until it is recognized by a business-class Selere. Mercenaries and guards are considered laborers. Warriors are either the personal guards, entertainment (gladiators), or special forces of the upper classes (business, leisure, and ruling class). They are skilled at their craft, the art of combat and strategy, and the exceptionally skilled may find advancement in rank within their class. Warrior training is expensive and warriors, in turn, are well paid by their upper class sponsors. Warriors are chosen and sponsored by the upper-class. Their class is usually inherited by their offspring (unless their offspring choose to live at a lower class). Sometimes mercenaries and successful guards are elevated to the class of warrior. When not plying their trade, warriors lead comfortable and a well-appointed lifestyle of leisure. Minor authorities are appointed by the various upper classes. They oversee and ensure the smooth functioning of day to day living among the lower classes. Minor authorities in charge of social events are sponsored by the leisure-class, those in charge of regulating the business of laborers are sponsored by the business-class. Those in charge of regulating warriors, ensuring the safety and success of a city, or in charge of diplomatic ties to other Selere cities are sponsored by the ruling class. The minor authority class is inherited from parent to child. The business-class are wealthy individuals who control small empires of laborers in a particular sector of commerce, such as entertainment, produce, textiles, basic services, and mining. Business-class members do not work at the tasks they oversee, but ensure the continued productivity of their area of expertise and the fair distribution of reward for effort. In large Selere city-states there may be several business-class leaders for the same sector of work. This class is inherited from parent to child. While part of the upper-class, business-class members work just as hard as most laborers do (which is to say, a moderate amount) to ensure their success in what is known to be a competitive class. The leisure-class are individuals with vast social standing, wealth, and independence. They are occasionally (and quietly) compared to the freemen, as they contribute little to society except to act as occasionally sponsors for popular entertainers. Leisure-class Selere live an exhaustive life of whimsical pleasure and self satisfaction. The ruling class, an exclusively inherited position, rests at the top of the Selere class system. Their lives are examples of finery. The ruling class rarely involves itself in the day to day workings of Selere society. Theirs is a higher calling of keeping peace and prosperity through-out all of the Selere city-states. From the members of this class, from all the Selere city states, are the elected-for-life members of the Shedumen counsel whose responsibility it is to see that the Selere race conducts itself in a fashion pleasing to the Kraken - a god-like being that lives in the hallowed ground of the Bore. The Kraken, more formally known as the Krakenduman, is worshiped by the Selere as the lord of all the earth and water. This mythical and legendary being dwells in a deep pit, said to travel to the center of the world, around which the largest city-state of the Selere is built, Jsucluemae. There, the Kraken gifts it's finest worshipers with priestly powers and consumes the worst criminals of Selere society who are bound with weights and sent sinking into the depths of the Bore. Selere are omnivorous, growing a plenitude of undersea foods in protected coral beds and ranging from their underwater cities to hunt. Selere rarely venture out of the water for sustenance or profit. 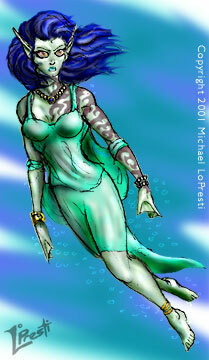 Selere's enhanced physiology prevents them from having half-breeds with humans and other surface dwellers.